It's Official: the FCC Just Killed Net Neutrality. Here's What You Can Expect Next. 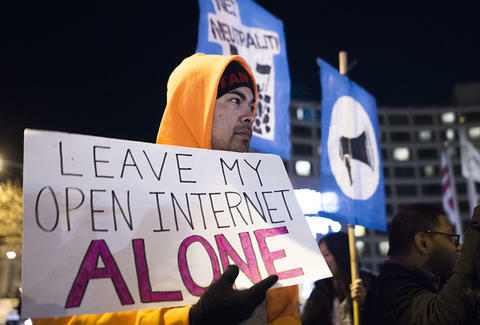 The Federal Communications Commission (FFC) made good on its controversial plan to upend sweeping Obama-era internet protections on Thursday, providing a final death knell for what a majority of Americans believe to be a free and open internet. The FCC’s monthly meeting is usually something that transpires without much attention, but the agency’s gutting of Title II net neutrality rules, which formerly forbade ISPs from giving preferential treatment to websites and apps of their choosing, was the culmination of months of protest from consumer advocate groups and major tech companies. Despite dissenting remarks from FCC Commissioners Mignon Clyburn and Jessica Rosenworcel -- and an unscheduled recess ordered by security personnel -- the agency voted to repeal net neutrality rules by a margin of 3 to 2. The scrubbing of the Open Internet Order, passed in 2015, was spearheaded by FCC Chairman Ajit Pai, a Trump administration appointee and former Verizon lawyer who’s made no secret of his plans to deregulate the telecoms industry. Despite reassurances from telecoms industry officials, the demise of broad internet protections is likely to have severe implications for everyone who uses the web in their daily lives. Without net neutrality, ISPs such as Verizon and Comcast could give preferential treatment to certain websites that they conduct business with, creating “fast lanes” for their subscribers while stymying access for other consumers. In this sense, it’s conceivable that Netflix could provide a seamless experience for subscribers of a few internet providers, while throttling access for others. Critics argue the deregulation would enable ISPs to charge consumers higher fees for premium access to their favorite websites and apps. Broadband providers have repeatedly tried to allay consumer fears about higher prices and shoddier connectivity, but the reassurances haven’t been comforting to advocates who call the move an unvarnished handout to the corporate sector. A minor concession shoehorned into the measure will make ISPs responsible for disclosing any throttling or prioritization of certain content. During the hearing, Commissioner Clyburn’s lengthy dissent was watched online by tens of thousands, despite Pai’s declaration that “no one” tuned in to the proceedings. The rules won't change overnight. A lengthy legal process is likely to unfold in the United States Court of Appeals, and as Gizmodo explains, the arbitration could very well last over a year and might even lumber its way to the Supreme Court. Still, it's clear that the current incarnation of the internet Americans have grown accustomed to over the last few years -- the web that's blossomed and evolved to a greater degree than ever before -- is in peril.